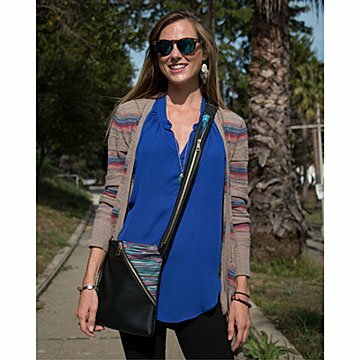 This innovative handbag features a pouch with a straw that you can sip straight from the strap. Mid-traffic jam, ten exits from home it hits: You're parched. You mine your purse for a water bottle, but there's not a drop (or convenience store) in sight. With this innovative, stylish handbag, you'll stay hydrated wherever you go. Featuring a nifty reusable water pouch, you can sip discretely from a straw tucked inside the strap. Fill it up before you leave the house or office, and stay quenched through subways stops and long walks. It makes a great gift for women on-the-go and—when it's after hours—can be filled with beverages of the adult variety. Made in Washington. 9" L x 10" H; Adjustable Strap 18" - 29.5"
Since purchasing my Smith & Starr bag The Conway I have been so thankful I made the purchase. I now have 2 in different colors. I have never been the best at drinking water mainly because I forget to bring some with me. I have found this bag for travel and festivals life changing for this reason. I also wear the bag out at night and friends are usually asking me for water because the line to the bar is too long. Highly suggest this bag!!! This bag has changed my life! I am obsessed with this bag. Firstly it's made sustainably in China out of VEGAN leather! Second I used to be the girl who brought my water bottle everywhere and it is such a relief to have a small cross body that my water is built into! My favorite times using it are day trips wandering around the city and nights out going to bars/ concert venues. I was always given a hard time trying to bring a bottle into concerts and now the bag discretely hides it for me! Love my Conway so much! I've had it for about a year and it's become my go-to weekender bag while I'm out walking the dog and shopping, brunching, running errands etc. I don't like carrying a large bag, but I used to have to because I drink a lot of water and my water bottles never fit in my smaller crossbody bags. The Conway is the perfect solution with the water compartment and tube built in. Makes for a great gift as well.